Makoto Shinkai's Your Name has grossed a total of US$281 million worldwide. Even people who have no idea about anime and manga have heard of Studio Ghibli's Spirited Away, the tale from legendary director Hayao Miyazaki of a girl lost in the land of spirits. 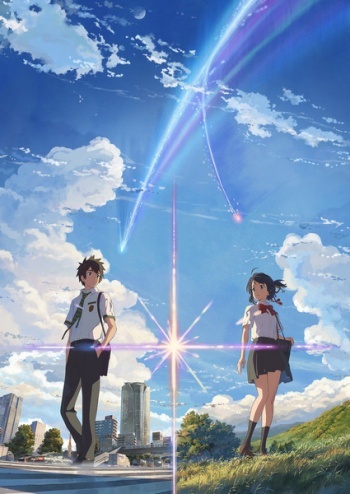 Since its release back in 2002 it has held the title of highest-grossing anime movie worldwide, but now, Makoto Shinkai's Your Name has just bumped it off the list. According to Box Office Mojo Your Name has now grossed a total of US$281 million worldwide, beating out Spirited Away's US$275 million. What's really impressive about this number is that Your Name still hasn't come out in the US! It is slated to open in 92 countries and territories, including in the United States through Funimation in the first quarter of this year, so these profits are just from Japan, China, Taiwan, Hong Kong, South Korea and Thailand. Expect it to completely smash the Spirited Away record when it finally receives a wider release! Your Name tells the story of a teenage boy living in Tokyo and a teenage girl living in rural Japan who suddenly wake up in each other's bodies. Though it may sound a lot like other Freaky Friday-type movies the plot in Your Name thickens quite a bit, and becomes a heartwarming and suspenseful tale. I would highly recommend seeing if if you get the chance!